We are dedicated to living in a sustainable way and pride ourselves that we grow our own seasonal vegetables, rear and butcher our own livestock and collect fruits and berries from right here on our farm to make jams and jellies. Visit Scotland has awarded us with Taste our Best award in recognition that we provide only the very highest of quality products to our guests which are sustainable, organic and has zero carbon footprint due to the fact we grow our own. We have the livestock specifically for food, so when you purchase meals you are directly contributing to the very existence of this farm, so we thank you for your part in this. 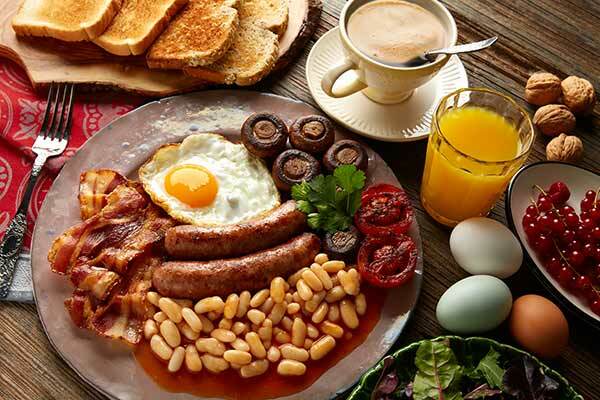 Breakfast is served between 08:00 and 08:45 and your pre selection menu will be collected from the deposit box on your front door at 19:00 (7pm). Please see breakfast menu for more info. Packed lunches if required are to be pre ordered along with your breakfast selection and noted on the comments section. If not prepaid the cost is £10 per person. Dinners are fully seasonal so please ask your host what the current offerings are and are 1 large course. If not prepaid the cost is £20 per person.